This is a great addition to my or any garage. I love the fact it is very sturdy, good looking and has tons of storage .love the stainless steel work bench top and the plenty of storage compartments .if organization is important then look here. Obviously I love my purchase . For customer service inquiries or to initiate a return, please contact NewAge Products Inc at questions at support@newageproducts.com or 877-895-2020. Get your power tools, seasonal decorations, gardening supplies and more organized with the Performance 2.0 Series cabinet system. With durable 24-gauge steel frames and strong double-walled doors, these cabinets are built to last, and they're fully-lockable, so you can rest easy knowing your valuables are safe. Easy-to-grab stainless steel handles give quick access to your items, and a frameless door design provides a clean, contemporary look to your space, with height-adjustable legs to accommodate for uneven garage floors. 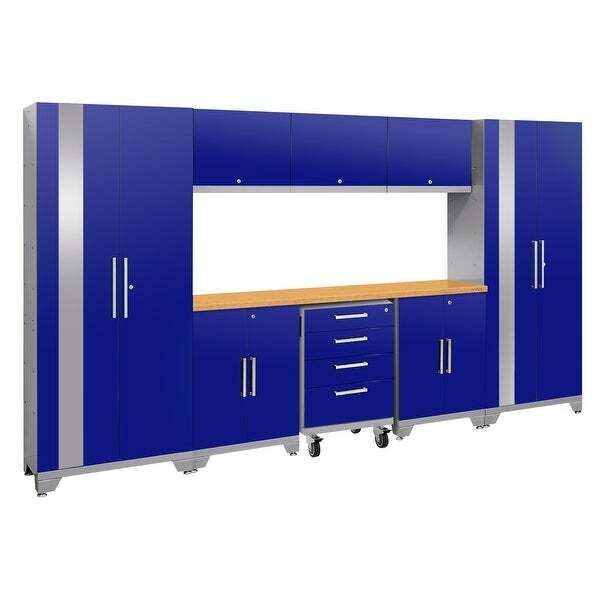 Flip-up style doors on the Wall Cabinets allow for a wider opening for retrieving paint supplies, and cleaning items, while adjustable steel shelves in the Locker and Base cabinets give you a customizable storage solution, with plenty of room for all your belongings. Durable steel cabinets, great for any space. With the Performance 2.0 Series Garage Cabinets, your home just got a lot more functional. Dimensions 132.0 In. X 18.0 In. X 77.25 In. Very well made ! I priced around online and researched other reviews , the few that I could find Said pretty much same ole thing, best bang for your buck if your looking for garage storage. Other brands were almost double the price. This set is so cool. I am a full time artist and build lots of big stage props. I finally spoiled myself with a proper workshop set up. I couldn’t be happier. Set is packed extremely well. It is super heavy. Easy to put together. Extremely well made. I am impressed to say least! Ended up buying other items from New Age...they make terrific products. Well made product. Company replaced an I correct part and a damaged door. Looks great! Surprisingly good quality for the price. Easy to assemble. Good product. I had a problem with one of the pieces, and they shipped another one out immediately. "What is the difference in the No Accessories Black versus the Slatwall stainless Black?" "What is included in the slat wall option?" "Are the feet adjustable? I have an uneven garage floor (so it doesn’t get flooded) but, I want to be able to adjust this so it’s level." I have these products in my garage and now I'm buying another two sets for my house and barn they are very easy to adjust. They will function on virtually any floor. To organize my garage. This is the very best online price. "What are the dimensions for each piece and can they be separated?"